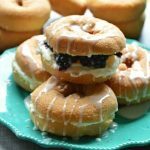 Soft from-scratch rolls filled with brown sugar, cinnamon, and fresh blackberries, topped with a smooth cream cheese glaze. 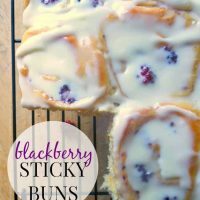 Blackberry Sticky Buns are my favorite way to use up fresh blackberries! I need to complain for a minute. About the weather. This doggone tropical weather that won’t let me get anyyyyything done. The grass has been halfway mowed for oh I dunno, a week? It looks really cool. There is an acre of dandelions between us and the road with a big stripe mowed down the middle. Classy. And then there’s Lucy. Missy Prissy Lucy that does not want any part of walking in high grass or getting her feet wet which makes walking her pretty much impossible since all we have out here is damp dewy high grass. Can someone please tell her that she is definitely mixed with some kind of bird dog and tall grass is supposed to be her thing? Or maybe we could just explain that she is a dog (one that is currently PASSED OUT on the sofa next to me with her head on a pillow like the diva she is). There are big muddy puddles at the front door AND the back. So leaving the house in sandals or flip flops means mud between my toes (ew) but wearing my polka dot rain boots means my feet are hot and sweaty (double ew). The most annoying problem though, besides the fact that my hair now has its own zip code I mean, is that I can’t get any work done!! 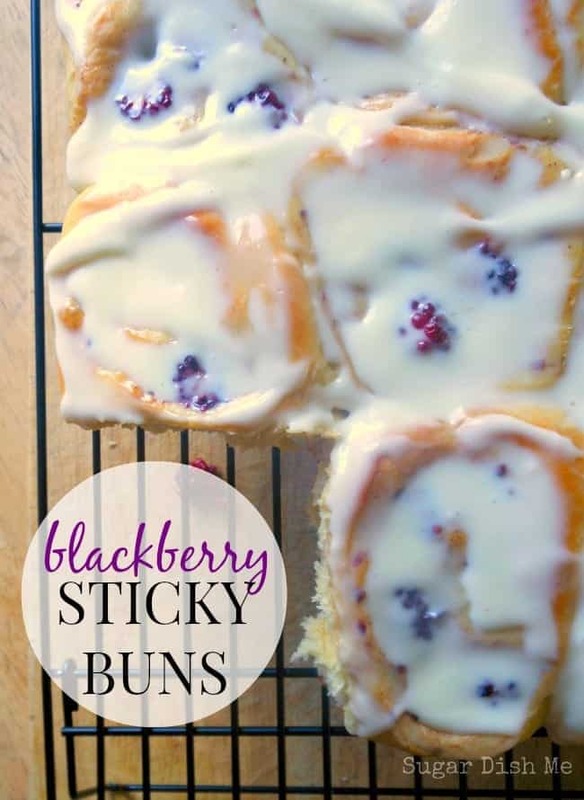 Example #1- Blackberry Sticky Buns. 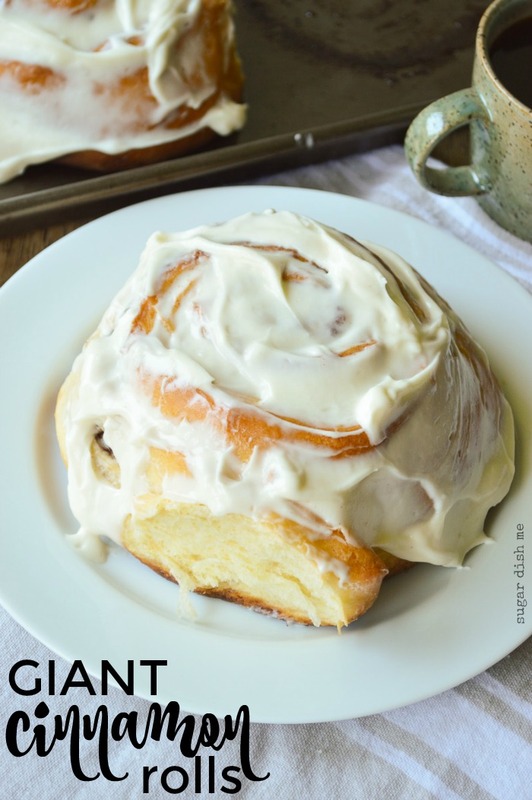 It occurred to me that I don’t have any sweet roll recipes on this site which is kind of offensive considering my mutual affection for both breakfast and dessert. So I hauled out my New Best Recipes from Cooks Illustrated book and found exactly the recipe I wanted to play with. For those of you that are unfamiliar, that book is like a kitchen bible. 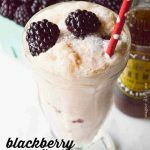 It is full of awesome basic recipes that can easily be adapted, and spells out all the reasons why a recipe will or won’t work. It is an amazing reference and I highly suggest you add it to your cookbook shelf! But no sooner than I could mix up the dough and get it to rise did the clouds return leaving me with a pan full of really pretty Blackberry Sticky Buns that do not look really pretty in photos. I probably should have opted to just make The Easiest Blackberry Cobbler. So the other day when we were talking about Peach Berry Crumble, and I was telling you that the food needs to LOOK like you wanna eat it? I was being serious. But where these Blackberry Sticky Buns are concerned please disregard that statement. Because even though the lighting is all cloudy blue, and I moved everything around so much chasing a sunshine that is obviously on summer vacation, that nothing is set up right and it all looks a little crayzay, these sticky buns are DELICIOUS. Like warm gooey pull apart bakery quality delicious. Like the local coffee shop with the fresh baked goods has nothin on these babies delicious. And they made me forget about all my muddy toe high maintenance puppy woes. You should know going in that this recipe makes a big pan of pretty gimantico sticky buns. They would be perfect for a sleepover or a family brunch. Or a Saturday morning in my house where the bottomless pits with annoying boy metabolism live. They also keep well (refrigerated) but are best all gooey and warm straight from the oven. Blackberry Sticky Buns are sticky sweet buns loaded with fresh blackberries and brown sugar, and then covered in a smooth cream cheese glaze. Perfect for long lazy mornings and a cup of coffee. In a small saucepan heat the butter and the milk over medium heat JUST UNTIL the butter melts. Keeping it on the cooler side will speed things along (because if it's too warm it will kill the yeast so you'll need to wait for it to cool down some). Remove from the heat and set aside. In a large bowl whisk together the warm water, yeast, sugar, and eggs + egg yolk until combined. Sprinkle in the salt, warm milk/butter mixture, and 2 cups of the flour. 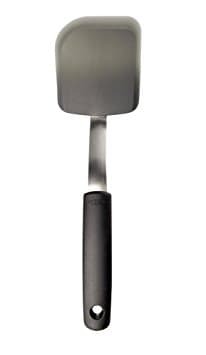 Stir until combined (I use a sturdy spatula or wooden spoon for this). Add the last 2 cups of flour and work them in (I just use my hands at this point), kneading the dough in the bowl for about 10 minutes, only adding more flour if the dough seems too sticky or wet. It should be soft, pliable, and shiny from the butter. Shape the dough into a big ball, place in a large oiled bowl, cover with plastic wrap, and let it rise for 1 1/2 hours. Butter a 9 X 13 baking dish. Toss the blackberries with the brown sugar, cinnamon, and cornstarch. Lightly dust a work surface with flour. When the dough has doubled in size lay it on the prepared work surface and roll it out to about 16 X 12, with the longer side closest to you. 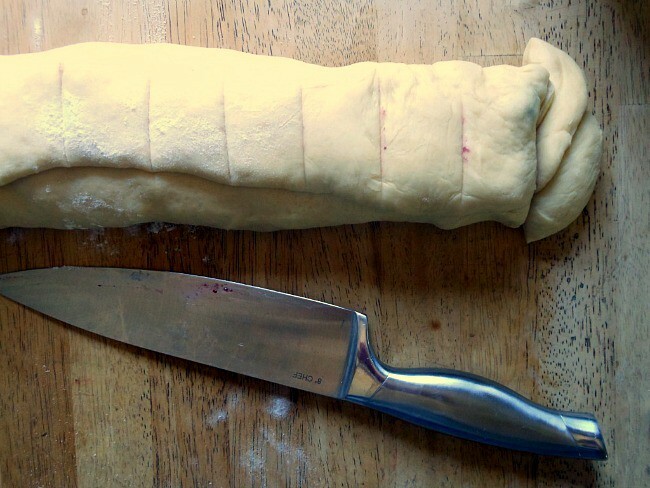 If you don't have a rolling pin just stretch it and press with your hands. This dough is really easy to work with. 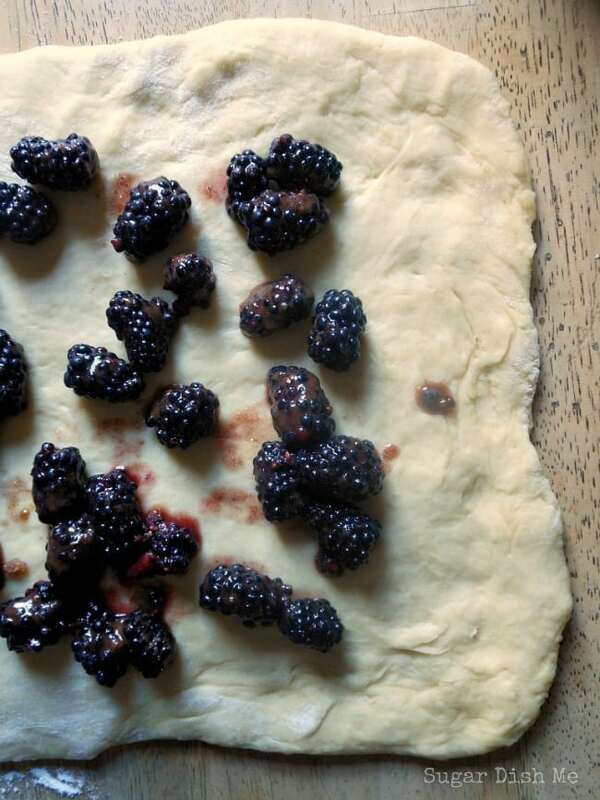 Scatter the blackberry filling evenly across the dough. Roll it up lengthwise (refer to blog post photos for visual aids) and cut into 12 pieces. Lay the pieces in the prepared baking dish, cover with plastic wrap, and let them rise for another 1 1/2 hours. Bake the risen rolls for 25-30 minutes. They will be golden and pretty. While the buns bake, mix all the ingredients for the glaze until smooth. When you take the buns from the oven, let them cool for a few minutes before inverting them into a wire rack. Flip them back over and frost them with the glaze. #1- Add only the LEAST AMOUNT OF FLOUR you can manage. You will definitely need the first 4 cups, but only add additional flour if your dough seems too sticky and wet. Humidity will play a role in how much flour you need and too much can make your rolls tough. #2- The corn syrup in the glaze is what gives it that glossy appearance just like the glaze from a package of cinnamon rolls. If you don't have it on hand feel free to omit it, but based on my results here I would HIGHLY recommend it!! 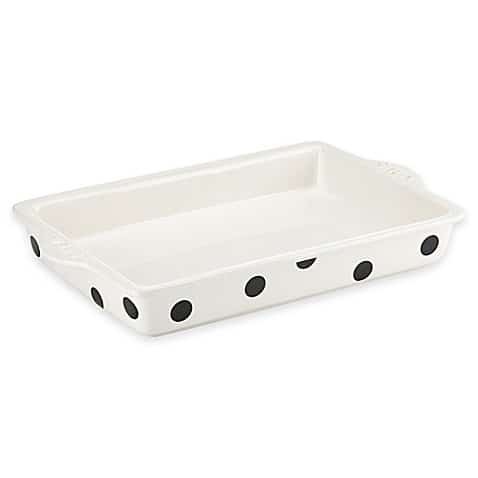 kate spade new york All In Good Taste 13-Inch x 9-Inch Deco Dot "Dive In"
It doesn’t get much more indulgent than Giant Cinnamon Rolls the size of your hand! You can make this coffee house favorite right at home! 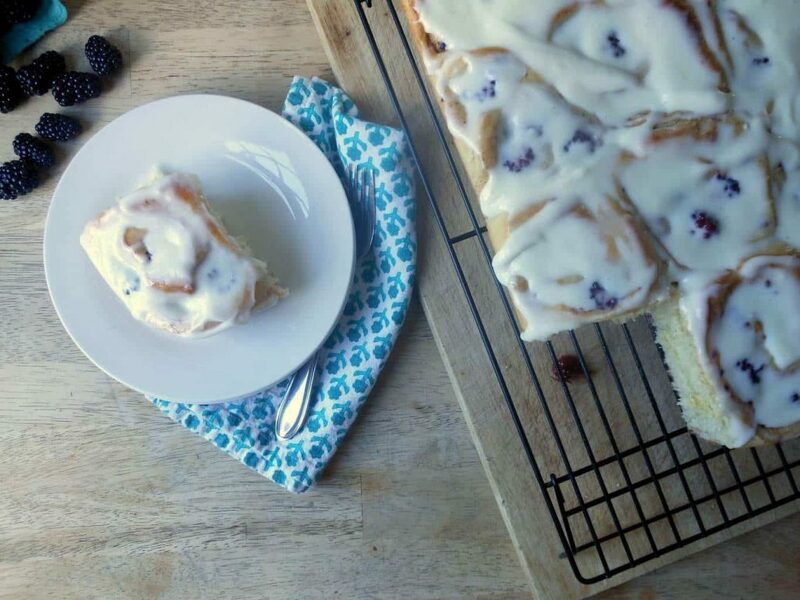 The dough is actually the same dough that we use in this Blackberry Sticky Buns recipe. It’s soft and pulls apart easily, but is also sturdy enough to hold fruit of loads of buttery cinnamon filling. Not a bad thing AT ALL!! I definitely licked the frosting. Several times. Ohhhhh my. Love the look of these Heather! Thanks, Nicola! 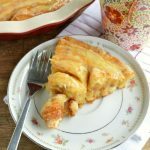 This was my first attempt at a yeasted sweet roll– they are AWESOME!! You could pull these off no problem. They look wonderful. 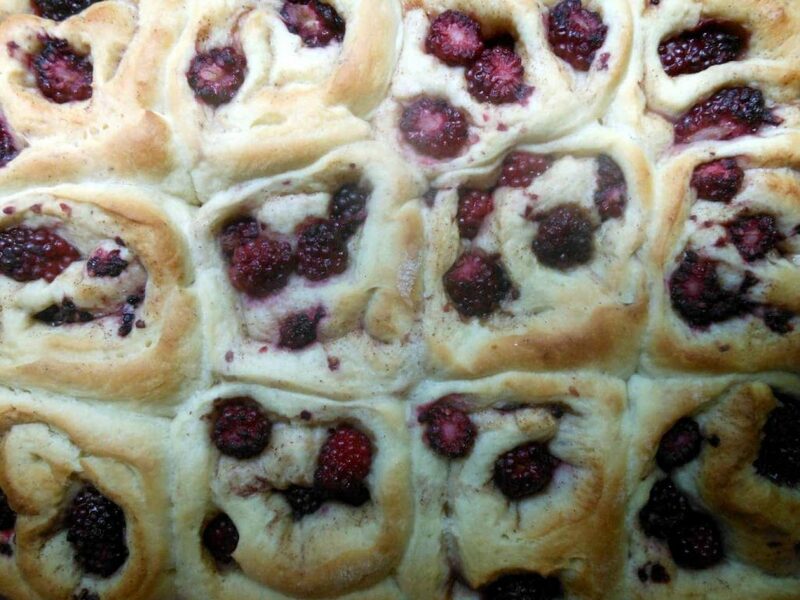 Combining sweet rolls with blackberries is heavenly! I definitely feel like every time I go to take photographs lately, it starts pouring. No bueno. I’m not sure anything could make these glorious buns look bad though! The clouds are on my nerves for sure. I’m not sure I prefer the raging heat either though. I think I’m ready for fall. Well, they do look like I wanna eat them to me! I love the corn syrup in cream cheese glaze tip. I’ve never done that! Thank you!!! I have played around with all kinds of variables to try to get my CC frosting to stay smooth, not harden up, and get ‘crunchy’ after it’s been exposed to air. I have the best results with using granulated sugar rather than confectioners for some reason. But your idea is way better. And your rolls look perfect!! And…The New Best Recipe IS the kitchen bible. Word. It was totally a Cook’s Illustrated tip! One that worked fabulously. Those sticky buns were hanging around here for several days and the frosting never got crunchy or hard– it stayed glossy & creamy. I’ve never tried using granulated sugar for cream cheese frosting- I’ll have to give that a shot! Sorry about the weather…can’t think of a better way to get through it than with lots of sugary sticky buns. They look delicious!! Well when I do make these, I’m going to want a big pan full! 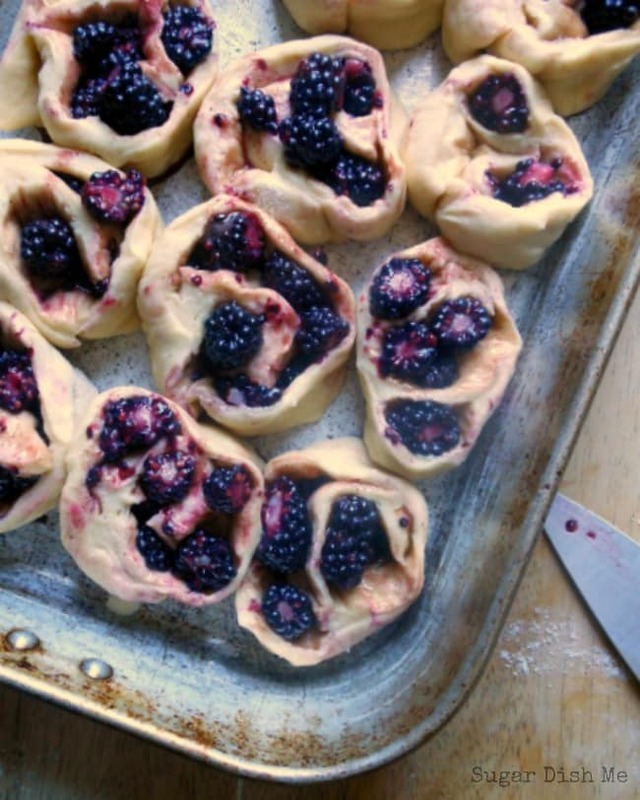 These are wonderful with all those plump blackberries! I love the name of your dog. If we didn’t end up pregnant with our daughter Lucy, I knew we’d be getting another dog so I could use that name! These are gorgeous! I love Cooks Illustrated too! I get so intimidated with playing with yeast. I gotta get over that cause I’m missing out for sure!! 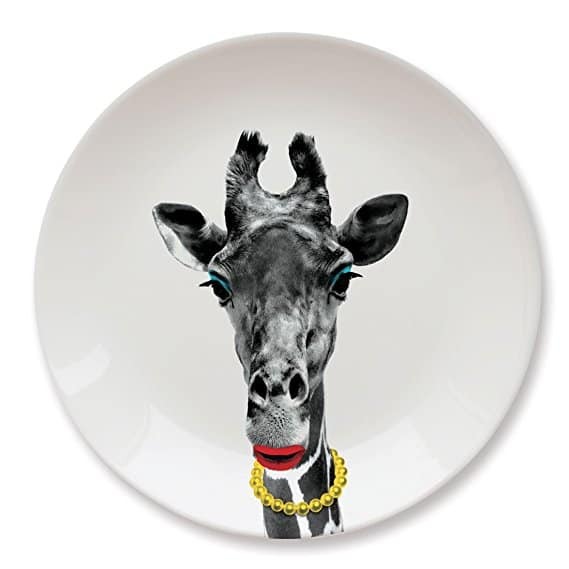 Oh wow – these are amazing! These look divine! 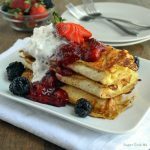 What a great way to use all those summer berries I have lying around! Yeah they look devine! I wonder if you can use Raspberries instead of Blackberries. Regarding the granulated sugar in frosting? I’d think it would be grainy so I’d use powdered sugar. Have made Cinnamon Rolls and Sticky Buns but not with fruit. It’s hot here as well and I’m ready for the cooler weather! Thanks Heather! You can definitely use raspberries! Or blueberries. Or strawberries! And the frosting is actually a Cooks Illustrated recipe so TRUST — it’s pretty fabulous 🙂 Hope you enjoy!